So, you're getting married: congratulations! Now that the proposal and the engagement ring are out of the way, it's time the think about the next important step in the process -- and we're not talking about choosing your china pattern here. It's time to buy your wedding rings. You'll quickly realize that this can be a whole adventure unto itself, because selections of wedding rings vary widely depending upon gender and your budget. You've got plenty of options, but unless you decide to go the simple route and select identical wedding rings, you're in for a process that can consist of equal parts fun and frustration. Your first task when selecting wedding rings is to determine how much you're willing to spend. Remember, wedding rings are intended as keepsakes of your wedding ceremony, symbols of the unending devotion you feel for each other, not trophies; so, if you only have a few hundred dollars to spend, that's fine. In order to meet your budget for wedding rings, be sure to shop around; don't necessarily buy the first thing you see that vaguely resembles what you want. With the advent of the Internet, you can often find excellent wedding rings for great prices online, often much better than you expected to be able to afford. You can also get good deals on wedding rings on home shopping channels. Do your research before committing yourself! 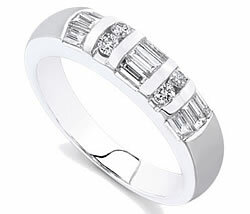 As for the wedding rings themselves, one of your most important choices is the type of metal that makes up the bands. Gold is beautiful, but the purer it is, the softer it is; anything higher than 18-karat gold is easy to scratch, deform, or abrade. Some people are allergic to it, too, so it's best to be sure your beloved isn't before picking gold. Silver is excellent for a right budget, but it too is relatively soft. If you can afford it, platinum wedding rings are your best bet. This silvery metal is very dense and strong, and unlike silver, will never tarnish. For the ladies, the task of selecting a wedding ring for your groom is fairly simple (which is great, because you've got so much else to do). You'll probably discover that your hubby-to-be doesn't need anything more elaborate than a plain unadorned gold band. It's hard for one of these simpler wedding rings to exceed the bounds of good taste, and they're ideal for everyday as well as special wear, so he'll never need to take it off. On the other hand, men's wedding rings have become more elaborate over the years, so it may be that he wants one of those half-inch-wide wedding rings paved with diamonds or something even more wacky and elaborate. The only way to know is to ask. Wedding rings for the bride tend to be fancier, and it makes sense to spend a larger part of your wedding ring budget for her ring. The type of ring you'll purchase depends on a number of factors, not the least of which is ease of wear. Large, elaborate stones look lovely, but they're easy to snag on things; if your bride is active in sports or works in a crowded environment, wedding rings with large stones should be avoided. Furthermore, it's a good idea to look closely at the setting. Bezel settings are best, because they hold the stone more securely, but they don't offer the most striking presentations. If you select a ring with a claw setting, remember that the heavier settings with more claws are the most secure.